Nothing feels better than slipping into cool sheets on a hot night, and many mattress shoppers concerned about coolness wonder if a memory foam mattress can fit the bill. Within the memory foam industry, there are a variety of formulas and iterations that can affect coolness. Reviews can help highlight differences between brands and models, and learning about composition and construction can help shoppers determine the best mattress for staying cool. This article will explain the basics of memory foam and compare two brands on coolness and comfort. 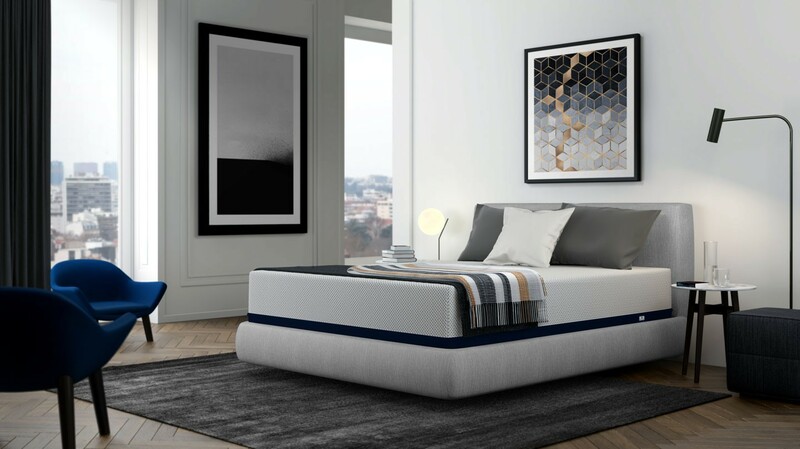 Engineered with extreme open-cell memory foam and a Celliant-infused mattress cover, the Amerisleep AS4 (formerly Colonial) mattress beats everything else on the market. The key to how Amerisleep gets the AS4 (formerly Colonial) to sleep so cool is their revolutionary foam Bio-Pur™. This foam has an extreme open-cell design which lets air move about freely while you’re sleeping. The other big advantage Amerisleep has over its competition is its Celliant-infused covers. Celliant® is a smart fabric that is clinically proven to increase bloodflow while sleeping which will help to regulate your body temperature even further. Want to know the best mattress of 2019? Read our guide to 2019’s beds beds. Gel infused foams contain aqueous gel mixed into polyurethane either via liquid or beads. The idea is that the gel will initially take on the room temperature and feel cool to the touch, however with 20 minutes it warms to the sleeper’s body temperature and has not necessarily shown to improve breathability. Now that you know the basics, it is time to compare three leading brands of memory foam. We looked at Tempurpedic, Amerisleep, and Serta iComfort, considering the information provided about their models and the consumer reviews on their respective websites. The following table provides an overview of our findings, which are discussed in depth afterward. All results were drawn from stated characteristics or collective analysis of owner reviews, which can be found on the retailers’ websites should you wish to investigate further. While individual mattress models vary within each brand, this comparison looks at all reviews to show general trends. In reviews for Amerisleep, less than 5% of owners complained of excessive heat. Tempurpedic beds had complaint rates of 10-15% for heat. Serta iComfort reviews indicated about 6-8% of owners reporting heat issues. This places Amerisleep and iComfort above average for memory foam, and Tempurpedic within the average range. The newer Tempur Breeze line showed a slight reduction in heat complaints, but reviews were limited. Odor is a concern of many shoppers. This refers to the offgassing polyurethane products exhibit during the first few weeks. About 20% of Tempurpedic reviewers mention odor, whereas about 6-10% of iComfort owners and 5% or less of Amerisleep owners mention odor. These differences result form formulation and also density differences. The plant-based memory foam from Amerisleep is certified free of harmful VOCs that contribute to offgassing odors, which explains the lower rate. Their plant-based foam also receives higher scores for eco-friendliness due to a healthier profile, zero-emissions manufacturing, and less wasteful shipping practices. Longevity refers to how long consumers can expect to actually use the mattresses and how well the bed holds up in terms of support. Tempurpedic and Amerisleep have similar lifespan expectations of around 10 years and limited reports sagging or loss of support. Serta iComfort reviews do exhibit a noticeable rate of people (7-9%) mentioning compression within 1-2 years, though they have a strong warranty. All three memory foam mattress brands cover sagging at a depth of 0.75 inches and have similar policy terms. Tempurpedic offers a 25 year warranty with 10 years full coverage, Amerisleep offers 20 years with 10 years full coverage, and Serta offers 25 years with 15 years full coverage. After the full coverage periods for each line, the remainder of the warranties are prorated (meaning the owners pays part of the cost depending on the age of the bed). To compare pricing, we considered a similar top-selling model from each memory foam mattress line, all featuring a 12 inch medium firm profile in queen size. The Tempur-pedic Rhapsody costs $3199, the Amerisleep AS2 (formerly Revere) $1199 and the iComfort Prodigy $1774. Other models also follow a similar pattern with Amerisleep being most affordable, Serta in the middle, and Tempurpedic most expensive. Tempurpedic and Serta also appear to charge sales taxes in most states though taxes apply only for Arizona -based Amerisleep customers. Tempurpedic had an average review score of 3.6 in 502 reviews, and 75% say they would recommend their bed. Amerisleep had an average review score of 4.6 in 408 reviews and 97% say they would recommend their bed. Serta iComfort had an average review score of 4.2 in 327 reviews and 83% say they would recommend their bed. With all factors considered, Amerisleep received an overall A-, with Tempurpedic and iComfort both receiving B ratings (iComfort’s total was about 2% higher overall, placing them in 2nd). Shoppers looking for a cooler memory foam mattress should consider density, memory fom type, and cell structure. Amerisleep’s plant-based memory foam received the lowest rate of complaints regarding heat, which is supported by Cargill’s study that found plant-based memory foam to be more breathable than other types. The higher density foam in Tempurpedic and the temperature sensitive properties of both Tempur and iComfort foams all appear to adversely affect heat dissipation. A memory foam mattress with a natural-fiber cover like bamboo or cotton can also improve breathability and help keep your bed cooler. Our Cloud Temperpedic Mattress is 10 years old. In the last year it feels damp & smells terrible there is no mold or mildew, just stink & damp. I was looking for Amerisleep 12 inch thick matress, twin sized but only 70 inches long for my RV living. Does anyone have experience with the Tempflow mattress? What would you recommend for a couple weighing together more than 750# ? I also get very hot at night and DO NOT want a mattress that makes me hot and sweaty. Also do you ever have end of year clearance or closeout sales or factory mistakes that are remarkably reduced as there is no way I can afford one of these. Thanks in advance for your reply. i would recommend a doctor. Which do you consider the best 10″ queen size firm memory foam mattress, costing less than $400.00, for use with an adjustable bed?